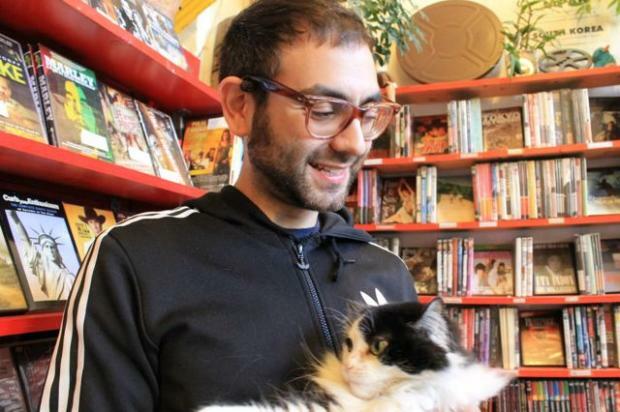 WICKER PARK — Mike Strum is one of the regulars at the Odd Obsession video store. On a Sunday afternoon, Strum decided on "The Mortal Storm," a 1940 film starring Margaret Sullavan, directed by Frank Borgaze. Odd Obsession has an entire section devoted to Borgaze. Strumm was pretty jazzed about that. "Netflix could probably send you most of this stuff, but it's more fun to get it from people," Strum said. A hair stylist and recent transplant from Los Angeles, Strumm happened to go past the video store on one of his first walks in the city. In the two weeks since, he estimates he's been back six or seven times. Owner Brian Chankin said Strumm is the sort of customer who keeps Odd Obsession going, at a time when most other video shops — big and small — have shuttered. "We keep our expenses low and are lucky that we have customers with discriminating tastes who come in regularly," he said. Over the past eight years, Chankin has grown his shop's collection of movies from 4,000 titles to more than 20,000. The films are categorized by director, country and genre. Some fall under subsets such as "Popular Hollywood Movies from 1980s," "Sexploitation" and even "After School Specials." "We sometimes choose a director and then watch all of his works consecutively," said Marilyn Volkman, a customer who is an interdisciplinary artist from West Town. Volkman had just checked out "Derrida," a documentary about a French philosopher. Her husband, Scott Waitukaitis, a physicist, was holding "Don't Shoot Me I'm Only the Piano Player," by Elton John. Volkman initially became acquainted with Odd Obsession when she was looking for a film by French director Jean-Luc Godard. A professor had put her into a group show called "Band of Outsiders." After hearing that there was a film of the same title, she came to Odd Obsession to rent it. "I think this place is really special. More people should know about it," she said. Waitukaitis added, "I keep telling Brian [Chankin] that they should get a popcorn machine here." Though it doesn't have a popcorn machine, the shop has two birds, and a cat named Precious who is turning 8 this year and grew up in the store's aisles. There are also plenty of house plants. Works from local artists who bartered their talent for late fees hang on the walls. A team of five unpaid volunteers assists Chankin. In return, they get free rentals and a chance to talk film with customers who come from all over the city. Because many of Odd Obsession's movies are rare, late fees and stolen movies can hit Chankin's bottom line hard. Near the register is a hot list of names of customers associated with missing movies. Chankin doesn't mind if his regulars see it, but would prefer that it remain unpublished. The highest offender has $4,392 worth of merchandise MIA. Another pet peeve is people who slide their movies into the overnight slot when the store is open. "You're dropping movies on the floor and running away. Come in and say 'hi,'" Chankin said.